How to install a full lace wig? Home	→ Blog → LACE FRONTAL WIGS → How to install a full lace wig? Beside posting the useful articles about the particular information of hair products, what can you find at Layla Hair’s website? These are the posts related to the way to install wigs, especially with customers who firstly use wig! 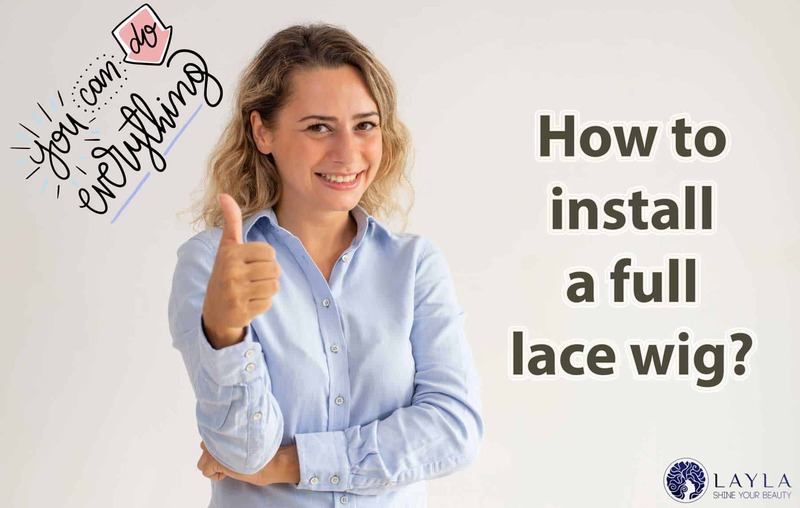 Today’s post will guide you how to install a full lace wig which is one of the most popular kind of human hair wig in recent years. Full lace wig is described as hair strands are knotted all over the wig cap to cover an entire head. Compared with other kind of lace wig, full lace wig has higher price. But it ensures a comfortable, natural new look and style for ladies. This is reason why many women really enjoy it indeed. So, now we will show you all steps to install a full lace wig to make you feel full after taking it to home. Step 1: Clean your scalp with shampoo and water to ensure the application area is oil-free. Next, cover your head by scalp protector to prevent your head skin from adhesive. Glue will be applied onto areas which the wig will attach by a brush. Then, blow dry them for about 30 seconds. Finally, attach the front part and the sides of the wig alternately on your forehead and matching areas on your head, then press firmly for some minutes. Step 2: Cut back the lace on the full lace wigs. First, place the wig on your head. Then, use hair clips to tighten the wig hair back away from your scalp line. Finally, trim the spare part of lace and any lace that sticks out past the wig hairline by sharp scissors. Be careful, otherwise you will cut any of the wig. You should leave no more than 1 inch of lace sticking out past the wig hairline. Step 3: If you are a person who own sensitive skin, you need to protect the skin area of your hair against the effect of adhesive on it. Use a cotton ball dampened with isopropyl alcohol to remove body oils effectively. Step 4: With your finger, coat a thin layer of adhesive on the whole hairline by a small makeup brush or cosmetic stick. If using a soft bond adhesive. You need to wait until the glue has become tacky instead of apply the wig instantly. The full lace wig can be applied immediately if you use hard a hard bond adhesive. Step 6: Pull the wig down and adjust properly. To avoid to be recognized the wig, you can iron to smooth down the hair on the top. In order to make the adhesive stick to your skin. Press down on the edges of the wig for five seconds. Now, style the wig following your own way. Full lace wig has become more and more popular with women all around the world. Although the application process normally demands adhesive products or guides from experts. There are some full lace wig you can apply at home without glue or tape. Now, you need wig clips, weaving needle and thread and hair clamps to carry out all following steps to install full lace wig without glue. Step 1: Firstly, turn the full lace wig inside out. Then, pull the hair on the wig into a ponytail or put a clip in it just in case it gets into the way when you start to sew the wig clips on to the unit. Step 2: The weaving thread’s color must be similar to the hair color of the wig to make the wig clips less be revealed. Take hold of one of the wig clips and put the bottom of the clips at the bottom, central part of the wig. Step 3: Start with inserting your weaving needle underneath the lace wig, then thread through each hole in turn on the clips. This means that you need to move to the next hole and insert the clip through the hole and next back down through the wig, then repeat this process to complete attaching a full lace wig. Step 4: Put another wig clip( round 3 inches) away from the clip that you have just sewn onto the full lace wig. Reiterate the above process to attach the clip to the lace cap of the full lace wig. Step 5: Turn the full lace wig to the right side about an inch above your ear where you attach another wig clip in. Do the same way with the left side. Clips will show your around hairline if you attach it in the front of the wig. Step 6: Turn over the wig back into the original position and put it on your head. Remember to insert the wig clips into your hair. Next, take off the hair clips from the wig and style your wig as your desire. Now, I hope you can install full lace wig easily without any professional or paying extra fee. Don’t worry if you face any problem in our product application process. Following regularly our website(http://laylahair.com) or contact us by WhatsApp((+84) 989 633 424) to be given Layla Hair’s support!